The field position denoted on your scorecard as 2 has never been an easy job. Errant balls, foul tips, and flying bats are all a source of pain for catchers. Collisions at the plate occur with regularity, some more painful than others. The backstops from baseball’s first fifty years endured daily physical punishment, all without the luxury of today’s protective equipment. Virtues such as strength, stamina, and courage in collisions were in high demand. No protection short of a bunker could have spared twenty-three-year-old Ray Fosse the career-impacting injury he sustained in the 1970 All-Star Game. Catcher-turned-announcer Tim McCarver says he still suffers from nerve damage in his neck caused by back-to-back plate collisions a quarter of a century ago. Today, catchers often put their bodies literally on the line, most often the one on the third-base side. Catchers are expected to take their lumps without grumbling. But the early efforts of catchers to protect themselves met with a lot of flak. A typical reaction came from the crowd at the Polo Grounds when the New York Giants opened the 1907 season against the Philadelphia Phillies. As the Giants took the field, star catcher and Hall of Famer Roger Bresnahan looked more like a goaltender than a backstop when he squatted behind the plate in a pair of thickly upholstered shin guards. It was the first time a catcher had dared to don the protective gear in open view, and the crowd’s reaction came as quickly as a foul tip and just as nasty. “Spectators howled with delight when a foul tip in the fifth inning rapped the protectors sharply,” reported the New York Times. Bresnahan, more concerned about his livelihood than remarks about his manliness, ignored the insults from fans and foes. 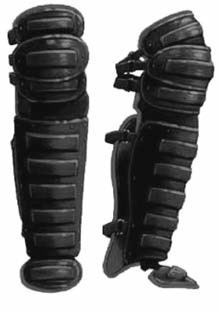 Bresnahan’s shin guards were the final pieces of the catcher’s major armor, following the glove, mask, and chest protector. This armor kit was lovingly dubbed “the tools of ignorance” by Herold “Muddy” Ruel, a backstop and a lawyer who caught for greats like Walter Johnson with the Washington Nationals in the 1920s. Ruel probably would have stayed a lawyer if he’d caught in the late 1860s when catchers had no equipment. New York Mutuals catcher Nat Hicks was the first backstop to start creeping closer to batters, in the 1870s. Before Hicks, catchers stood far behind the hitters, fielding pitches on the bounce. Hicks paid for his fearlessness with repeated and sometimes severe damage to his face and a near-loss of his right eye in 1873. 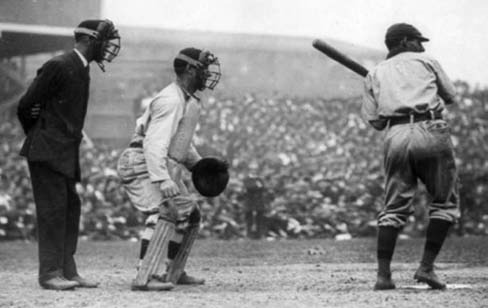 Most backstops began crowding the plate in the early 1880s, especially when a rules change dictated that the final strike, including foul tips, had to be caught on a fly for a putout. Pitchers had begun throwing overhand by 1884, when, after a rule change in the National League, all restrictions on the pitcher’s delivery were removed and he could throw underhand, sidearm, or completely overhand, as he wished. Also, the consensus is that the mound was created in 1893 or shortly thereafter. Up until that year the pitcher’s position was known as the pitcher’s box. In 1893 the pitcher’s rear foot was moved farther from home plate to its current distance of 60 feet, 6 inches. Moving closer to the batter enabled catchers to better frame the pitches, field bunts, and throw out base-stealers. In 1901 the National League instituted a regulation that a “catcher must stand within the lines of his position whenever the pitcher delivers the ball and within ten feet of the home base.” The American League adopted this rule the following year. Current rules state that the “catcher shall station himself directly back of the plate . 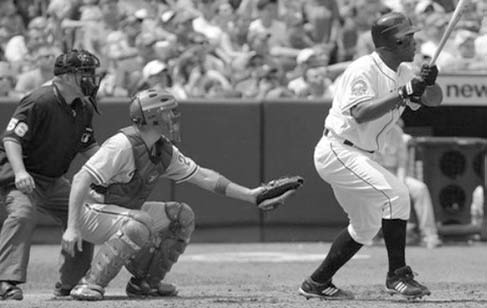 . . with both feet within the lines of the catcher’s box until the ball leaves the pitcher’s hand” (Rule 4.03[a]). The catcher’s box measures 43 inches across and 8 feet long from the plate backward. The first piece of protection for catchers, a rubber mouth protector, dates to the 1870s, purloined perhaps from the sport of bareknuckle boxing. George Wright, brother of Red Stockings founder Harry Wright, preceded the mask with this “mouth protector.” His invention was a fifty-cent rubber mouth guard, similar to the mouthpiece a boxer wears. This innovation, according to newspapers of the time, surely cut down on the talkativeness of catchers. Masks were more obviously a protective device. Probably the first one was invented by an Ivy League man, Fred Thayer, who in 1876 adapted a fencing mask for Alexander Tyng, then with the Harvard Nine. At first, Thayer’s better mouse trap was derisively called a rat trap. But the catcher’s mask caught on quickly among pros and amateurs alike and was in wide use by the 1880s. Besides affording protection, it helped fielding from the very first game. Harvard’s Tyng made only two errors in that April 12, 1877, match, exceptionally low even for a pro catcher in those days. 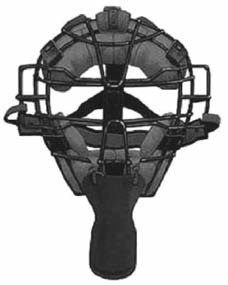 Thayer’s patented mask (patent 200,358) went into the Spalding catalog for the 1878 season, and adaptations followed quickly. Its simple forehead and chin rests were embellished with padding—made from “imported dog skin,” according to one Spalding catalog— to insulate the steel-mesh frame from the catcher’s face. Better visibility was always a goal in catcher’s masks. Inventor George Barnard patented his “open view” mask in 1888 (patent 376,278) that afforded both protection and vision. These wire-basket cages worn by the 1890s backstops like Roger Bresnahan and Marty Bergen gave way to the greatly improved peripheral vision of the so-called Open Vision and Wide Sight masks by the 1911 season. A. J. Reach created this mask (patent 1,012,223) for the purpose of removing the vertical bar for better visibility without sacrificing structural strength. 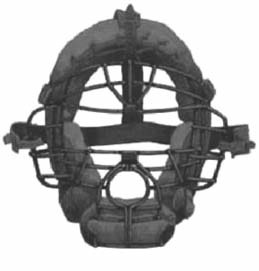 The “platform mask,” a one-piece aluminum casting with horizontal crossbars instead of soldered mesh, was patented by umpire James E. Johnstone in 1921 (patent 1,449,183). Mesh still evolved, though, getting springy, shock-absorbing action and ball-deflecting shapes in the 1920s. One such mask designed by H. Goldsmith in 1923 (patent 1,475,991) had a padded “oval surround” with two cross bars. Other mask materials have come along, but carbon-steel wire mesh remains the material of choice to this day. Catchers prefer the welded-wire guard because it has better air movement and fewer massive bars that could obstruct visibility. Carbon-steel wire is used because it’s flexible but strong. The goal is to get some deformation in the mesh to reduce some of the shock but still retain structural integrity. Sometimes one change in a piece of equipment necessitated changes in other catchers’ equipment. For example, with two-handed catching, using the pillowstyle mitt, the catcher’s hands followed the ball into his body. In the process, the catcher was tucking in his chin so his throat wasn’t exposed. Catchers today, with the hinged-mitt, one-hand the ball farther away from their bodies, and they’re frequently looking up, so the throat’s more exposed. This is the reason why today’s catchers wear masks with throat protectors, popularized by Dodger catcher Steve Yeager. In 1976 Yeager was kneeling in the on-deck circle when a bat shattered and a sharp piece slammed into his throat. To protect him from further injury, the Dodgers came up with the billygoat device hanging from his mask. However, throat protectors go back as early as 1888, as demonstrated by a Spalding advertisement for the Spalding’s Trade Marked Catcher’s Mask No. 30 with a patented neck protection. 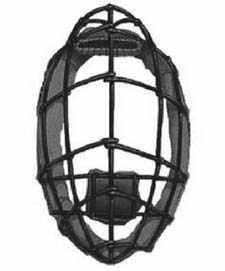 In 1903 the Victor Sporting Goods Company offered throat protection in its model 314N with a neck extension piece. The latest-version mask has the throat protector integrated with the wire face cage. The end of the twentieth century has seen the mask evolve into something resembling what Darth Vader wears. 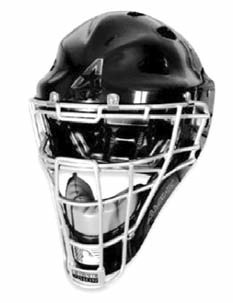 Its genesis sprung from hockey’s goalie mask, and it was introduced by catcher Charlie O’Brien. It is made of new high-tech polycarbon, and O’Brien’s mask was designed by Jerry Van Valden of Toronto-based Catch You Later Headgear. The helmet protects the top, sides, and back of the head, yet the cage-like opening in the front is bigger than that of a normal mask. It increases a catcher’s peripheral vision and deflects the ball rather than hitting the catcher flush as does the previous mask. At 50 ounces, the helmet is about 10 ounces heavier than a normal mask/helmet combination. Several major-league catchers have begun wearing it, and soon it may be a standard piece of equipment. Mitts were a taken-for-granted part of catching. An early documented use of a glove by a player occurred on June 28, 1870, and that was by a catcher. A sportswriter for the Cincinnati Commercial cabled his office, “[Doug] Allison caught today in a pair of buckskin mittens, to protect his hands.” It was printed in the next day’s newspaper in a recap of the game between the Cincinnati Red Stockings and the Washington Nationals. Also, a report appeared in the Detroit Free Press on August 14, 1867, of a catcher named Ben Delaverage playing for the Victory Club of Troy using a catcher’s glove. In the late 1870s gloves came into common use. At first players had to skulk onto the field. But star pitcher– turned–first baseman Albert Spalding made it a manly thing in 1877, boldly donning a black glove that was fingerless but padded. Ever the entrepreneur, Spalding envisioned big sales for his mail-order sporting-goods business. Catchers were among his best customers. 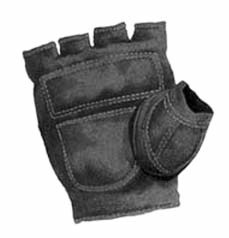 Inventor A. C. Butts patented a fingerless glove in 1883 (patent 290,664), and G. H. Rawlings added padding in 1885 (patent 325,968). 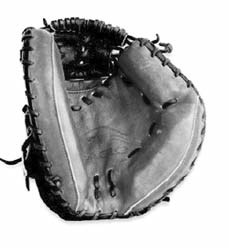 Historians quibble over whether Harry Decker, Joe Gunson, Ted Kennedy, or Jack McCloskey first used the padded catcher’s mitt in the late 1880s. By one account, the Kansas City Cowboys’ Gunson dreamed up the mitt, but he was too busy catching in Al Spalding’s world baseball tour to take advantage of the idea. So, ex-catcher Decker filed a patent on his mitt design in 1889 (patent 408,650). The “Decker Safety Catcher’s Mitt” was a contraption that was basically a glove stitched to the back of a round pad that covered the palm of the hand. These gloves were literally flat pillows that got their pockets broken in on the job at the expense of the catcher’s palm. Decker modified his mitt in 1891 to a more comfortable design (patent 447,233) with the addition of leather lacing on the back of the hand to hold the mitt in place. It was not until 1895 that stipulations concerning the use of gloves were included in the rules: Those limited the size of gloves to ten ounces and fourteen inches circumference for all players except catchers and first basemen, who were permitted to use any size glove. The early gloves, lacking webbing and lacing, merely provided protection for the hands. Nineteenthcentury players often wore gloves on both hands. For the throwing hand, they would simply snip the glove at the fingers for dexterity. 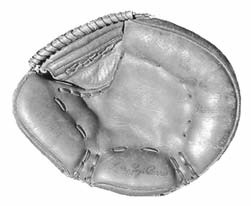 In 1899, J. F. Draper came up with the round, pillowstyle mitt (patent 627,687) that, with several minor modifications, remained the same tool that catchers wore up until the 1920s. R. H. Young in 1920 modified this standard pillow-mitt to disperse a billow of air to form a cushion when the ball was caught (patent 1,362,280). Mitts were pretty small, flat, and shapeless throughout the dead ball era until a Rawlings employee, Harry “Bud” Latina, who designed dozens of mitts/gloves, created a better mitt. 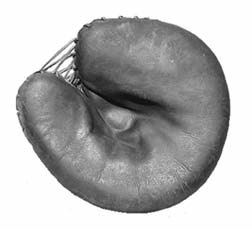 This hand/fingers design made the mitt loose enough to permit it to be dropped quickly or thrown off but not accidentally by using finger loops (patent 1,562,176). This became the standard for more than forty years. Additionally, it had a real change in the depth of the mitt so the ball would really stick, even though the catcher still had to use two hands. The catching technique with the pillow mitt was to stop the ball with the relatively stiff mitt, then secure it with one’s bare hand. This was accomplished by holding the bare hand behind the mitt and quickly moving it to the caught ball. But if the catcher had to move his mitt to catch a ball and failed to move both hands in unison, the bare hand could easily be exposed and subject to harm. Jammed and broken fingers were very common injuries during the pillow-mitt era. Modern mitts have evolved to match today’s style of baseball. Catchers now have to one-hand or backhand the ball, which means that they have to work much lower because now the pitching is lower (at or below the batter’s knees). However, when a catcher is that low, he can’t hold two hands out in front or even one with the fingers pointing up and parallel to the body. In the 1950s, catcher Gus Niarhos cut an opening in the back of his mitt so he could squeeze the two sides together a little bit, like a fielder’s glove. This led to catcher’s mitts with breaks in them and long oval pockets. Previously, mitts had a pocket but no breaks, and the backstop caught two-handed so the ball wouldn’t pop out. One-handed catching became possible with the hinged mitt, popularized by Johnny Bench and Randy Hundley in the late 1960s. With these, a spring-action hinge snaps the mitt closed on contact with the ball. The ancestry of the flex-hinge catcher’s mitt goes back to the first baseman’s mitts of the 1950s. Logically, one might suppose that former first basemen (like J. C. Martin), converted to catchers in large numbers in the early 1960s, would have been the ones to introduce the mitt. But in fact, the flex-hinge catcher’s mitt was introduced by Hundley in 1966 and Bench in 1968; neither of them had ever played first base. New and sometimes quirky innovations in mitts have arisen since the 1960s. For example, in 1975, Al Campanis, former general manager of the Dodgers, introduced an orange fluorescent stripe around the perimeter of the mitt to help pitchers concentrate on their targets (patent 3,898,696). This caught on, but not every development met with acceptance. Most catchers didn’t think much of another innovation in mitts, the oversized “Big Bertha” designed by Baltimore Orioles manager Paul Richards in the late 1950s. Supposedly it was to help his receivers handle the maddening knuckleball of Hoyt Wilhelm. Such baskets grew to a 45-inch circumference before being regulated to 38 inches in 1965. The surface area might help one knock down the ball, but it hindered one’s view and cut down on hand mobility. One other drawback of the “Big Bertha” was that even if one caught the ball in that glove, it was hard to find it in time to catch base-stealers. Some current catchers are keenly interested in the latest wrinkle in mitts, a “digital leather” glove made by Franklin. The innovation is already found in Franklin’s current line of fielders’ gloves and will make its debut in catchers’ mitts soon. The facing leather is etched with a pattern of grooves and diamonds whose purpose is twofold. First, the pattern absorbs the shock of impact. Then, its contours grab the ball and stop its spinning action. Both attributes might turn some hardhands into soft ones. Webbing, air or gel cushions, and other elements of glove design have dealt with the velocity of batted and pitched balls, but only lately have manufacturers turned their attention to the spin factor. The rotation on a baseball can be quite high, 1800 rpm or more on a curveball, for example. Franklin likens its digital leather to the road-gripping pattern of a tire. That leaves the near-spinless knuckleball to contend with, a problem sure to be compounded as more hurlers follow knuckler Tim Wakefield and other “goofy” tossers. Women got into the act of making catching a safer profession. Legend has it that the wife of Detroit Wolverines catcher Charles Bennett devised a chest pad to protect her husband during games. He wore the creation outside his jersey in 1883. While some accounts say that catchers experimented with chest protectors earlier in the decade, these image-conscious receivers tried hiding the devices beneath their uniforms to avoid razzing. Left-handed throwing catcher Jack Clements in 1884 was quoted as saying that he wore a “sheepskin,” as chest protectors were first called, beneath his uniform to avoid being called a sissy. James “Deacon” White, a nine-year catcher in the 1870s who switched to third base for nine more years, supposedly created the first chest protector in the early 1880s. His design included a canvas-covered rubber bladder pumped full of air. Padding eventually replaced the air tubes. 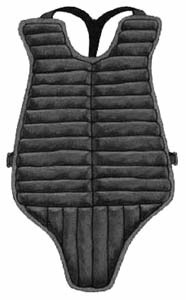 Today’s chest protectors, although ribbed with light but shock-absorbing polyfoam, have come full circle from the original fur-stuffed sheepskin “breast protectors” worn under the uniform until 1884. Along the way, catchers and umpires got inflatable vests. 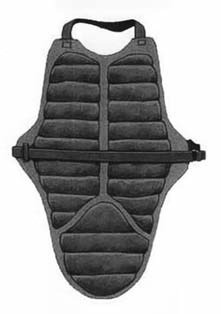 “Gray’s Patent Body Protector” (patent 295,543) with its rubber-bladder ribs sold for $10 in 1891, twice the price of stuffed canvas or leather. Gray’s Protector didn’t cover the shoulders, a prime target for foul tips. John Gamble in his 1903 design added inflatable pads that covered the shoulders (patent 745,007). Although umpires stuck to inflatable protectors until modern times, catchers quickly went for the maneuverability that lightweight stuffing like kapok afforded. Kapok is a lightweight material used in life jackets. Today, chest protectors are filled with foam. 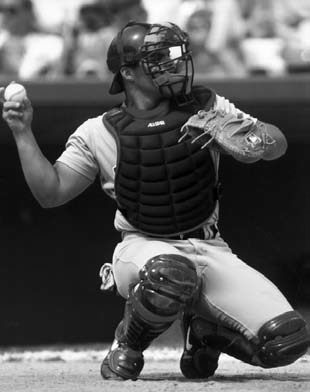 Stuffed protectors enabled backstops to crouch and to run to back up bases. 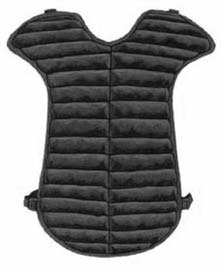 F. W. Glahe in 1963 came up with a very flexible chest protector (patent 3,076,197) that greatly improved mobility. One of the last modifications to the chest protector was the addition of removable shoulder flaps. M. Neuhalfen in 1991 patented his design (patent 5,020,156) that guarded against those nasty foul tips flying into the upper arms. With the advent of ballistic materials, velcro, breathable cloth, and polyfoam padding, catchers today are wearing the most protection possible with the minimum weight. 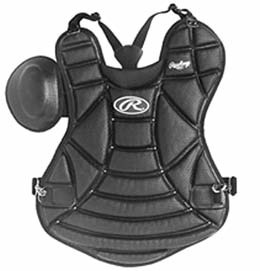 The 2008 version of the chest protector weighs less than half the chest protector that was available in the 1920s through the 1940s. Among the tools of ignorance, the designs of masks and mitts have evolved the most, in response to the way baseball is played. By contrast, chest protectors and shin guards haven’t changed as much. As early as 1890, catchers began wrapping their bare lower legs with newspapers or leather, which was then hidden beneath their uniforms. This evolved into more elaborate pads, all under their pants, but it took tough-as-nails Roger Bresnahan to have the nerve to admit publicly that his legs hurt from all of the wild pitches, foul balls, thrown bats, and piercing spikes. 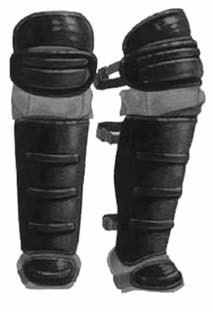 The curiosities that Bresnahan wore more than a century ago actually were a modified version of the leg guards worn by cricket players. Rods of light cane encased in padded fabric covered the shins, and padding protected the knees. Over time, padded leather covered the kneecaps, insteps, and ankles. Hard, heavy fiberboard guards appeared in Rawlings ads in 1916. In the 1920s and 1930s, fiberboard supplanted cane. Various inventors played around with the fiberboard design, including D. Levinson in his 1918 idea (patent 1,253,260). 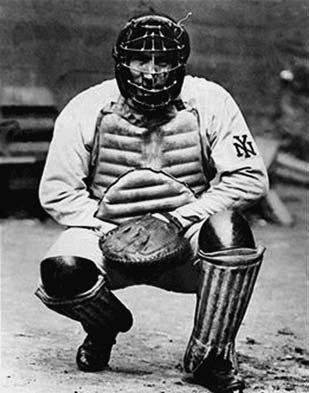 William Barrett in 1927 patented the prototypical catcher’s leg guards (patent 1,624,129) that uses essentially the design seen today. 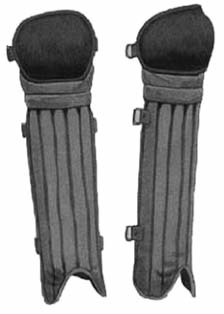 The hinged shin guard was developed by the Dodgers in the late 1950s, one of three notable catcher inventions they created. (The billygoat throat protector and the hinged mitt were the other two.) By the 1960s, light but tough molded plastics replaced fiber. How tough? Announcer and former catcher Tim McCarver survived two collisions in which the spikes of ex-Met Tommy Agee became embedded in the guards. 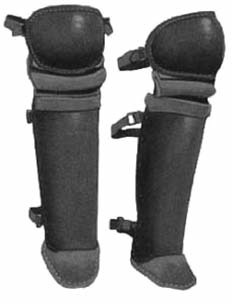 In 1995, W. F. Hunt Jr. patented leg guards with adjustable lower thigh pieces to facilitate lower crouches and increased protection (patent 5,452,475). G. J. Collins followed up with his multiple-piece thigh and knee guards in 2004 (patent 6,687,912). The next generation might well include complete, flexible, and lightweight leggings made from Kevlar and worn throughout the game and not just when the catcher is behind the plate. Catching has never appeared to be an easy or cushy job. Even with protective accessories, the position seems to lead the league in injuries yearly. That’s why safety and productivity have been the goals of a variety of catching inventions throughout the history of the game. Baseball, though it sometimes seems the most tradition-bound of sports, has always shown that all-American penchant for tinkering and innovation. This quest for the better mouse trap has been amply applied to catchers’ gear. The evolution of the equipment corresponds to actual changes in the tactics and rules of the game. The tinkering continues. Already a new “digital” catcher’s mitt, designed to soften the ball’s impact and reduce errors, has made its debut. Today the well-protected warrior behind home plate has taken advantage of modern technology, especially that developed for law enforcement. Body armor, for the catcher in the twenty-first century, might well be identical to the lightweight Kevlar vests worn under police officers’ shirts today. After all, if a thin, almost shirt-like vest can stop a bullet, it certainly can stop a wayward 95 mph fastball. So perhaps chest and leg protection will come full circle and the catchers of tomorrow will be wearing their armor beneath their uniforms just as the players in the 1880s did. CHUCK ROSCIAM, a retired navy captain with 43 years of active service and an amateur catcher for more than forty years, is the creator of www.baseballcatchers.com. His baseball writing has appeared in "The Baseball Research Journal" and "The National Pastime". Bjarkman, Peter C. The Baseball Scrapebook (New York: Dorset Press, 1991). Burns, Ken, and Geoffrey C. Ward. Baseball: An Illustrated History (New York: Knopf, 1994). Gutman, Dan. Banana Bats and Ding-Dong Balls: A Century of Unique Baseball Inventions (New York: Macmillan, 1995). Honig, Donald. The Greatest Catchers of All Time (Dubuque, Iowa: Wm. C. Brown, 1991). Hughes, Thomas. American Genesis: A Century of Invention & Technology (New York: Viking Penguin, 1989). Nemec, David, and Saul Wisnia. 100 Years of Major League Baseball (Lincolnwood, Ill.: Publications International, 1999). Obojski, Robert. Baseball Memorabilia (New York: Sterling, 1991). Owens, Tom. Great Catchers (New York: Friedman/Fairfax, 1997). Spalding, Albert. Baseball: America’s National Game (orig. pub. 1911; San Francisco: Halo Books, 1991). ———. Spalding’s Official Base Ball Guides, 1876–1913. Trucks, Rob. The Catcher (Cincinnati: Emmis Books, 2005). U.S. Patent and Trademark Office, http://uspto.gov. PERIODICALS: Antiques and Collecting, Sporting Life, The Sporting News.